She looked worriedly at the almost empty bottle of Paracetamol on her hand. She felt her baby’s forehead. It’s still hot. “I will need a new bottle soon.”, she thought. But how? She was all alone. There was no one to leave the baby with. Her little one started stirring. Suddenly, she had an idea! It’s a long shot but it was worth a try. With one hand, she fished for her mobile phone from the bag. She then logged on to a popular fastfood chain’s delivery website. You might have heard of this story before as it was in the social media circulation for a while. In case you haven’t, the mom was eventually able to get a bottle of Paracetamol for her little one. It was through the kindness of the rider who answered her plea to drop by the drugstore to get her some medicine. What if it wasn’t though. Well, the good news is we don’t have to risk our children’s health while banking on the kindness of strangers. There is now a way to order our kids’ medicines and vitamins online! It’s through the Hey Mom! website. It’s a place for moms of all kind (expecting, new, and seasoned) to learn more about taking care of ourselves and our family. 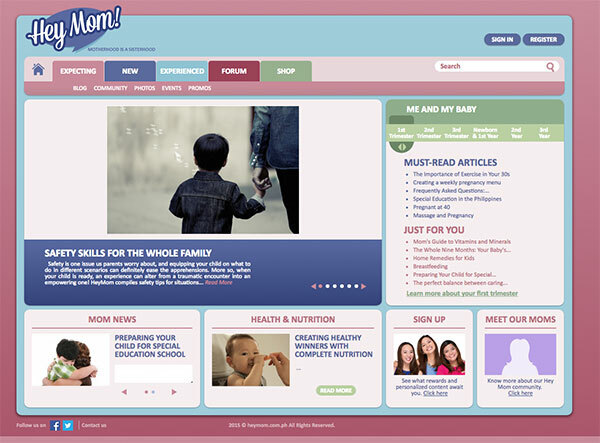 It has a number of parenting articles, a forum, and the most important part, a shop. 3 Good Reasons to Buy from Hey Mom! Below is the shop, which you can access through the main page of Hey Mom! 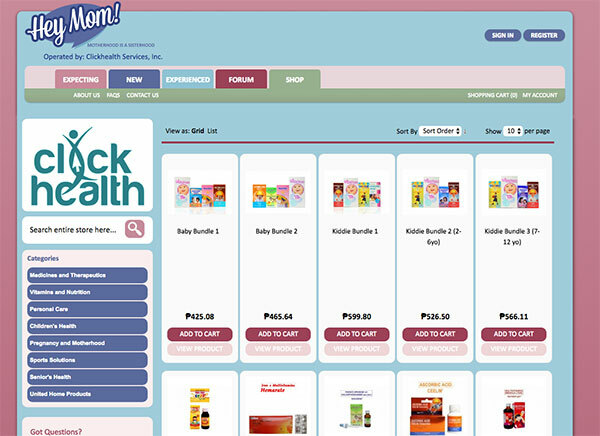 It looks just like any online store with items like vitamins and medicines as its inventory. I’ve tried purchasing from them and I have found 3 good reasons to make future purchases. Having an option to shop online is a real plus factor for busy moms like me. The husband especially hates it when I have to inconvenience him when I suddenly run out of Paracetamol to give the kids. What I do now is stock up on the medicine and in case I’m almost running out, I just order with the click of a button! Happy husband, happy me! Apart from that convenience, I love that Hey Mom! 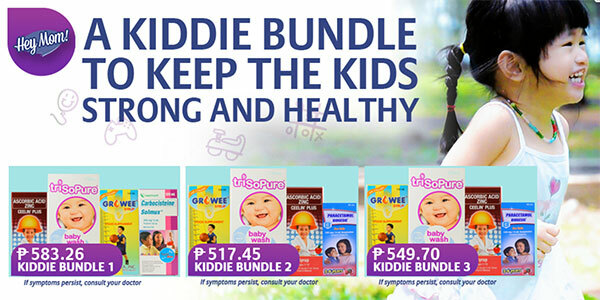 offers Kiddie Bundles that save me a lot of time. I usually buy the vitamins and the fever medicine together so finding them in a bundle is really great! I did a price comparison on some of the medicine that they carry and have found that Hey Mom! offers them at a lower price compared to grocery and drug store prices. 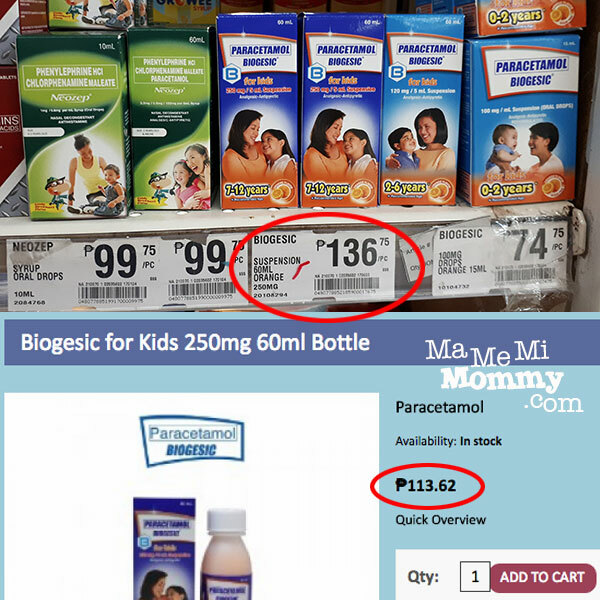 The Biogesic for Kids 250mg 60mL bottle costs P136.75 at the grocery, P122.25 at the drug store, and only P113.62 at Hey Mom! Delivery time was just 2 days inclusive of processing and courier transfer. I also liked that I was informed via text and email when my order was processed and when it was transferred to their partner courier. My orders came in a box with the appropriate bubble wraps (not in photo) for protection. Check out my box of health! The next time you’re looking to replenish your medicine cabinet, just reach for your phone, head to Hey Mom! and tap away! Oh, and it’s not just for the kids. 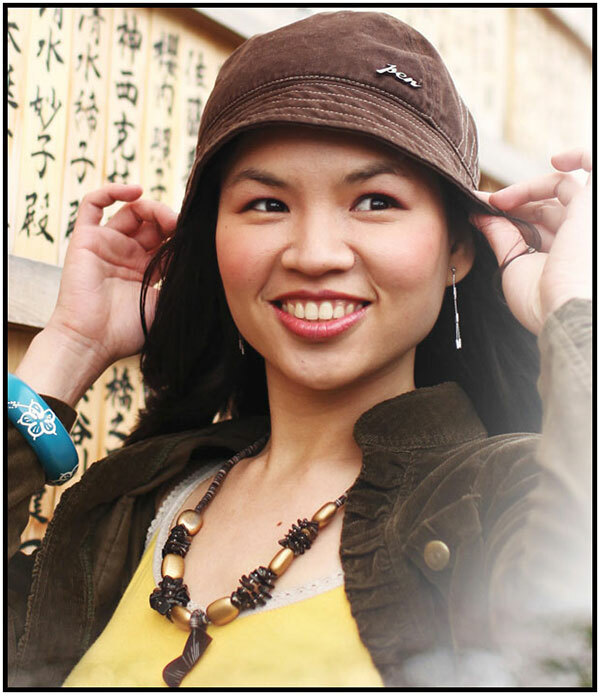 They also offer medicine and vitamins for men, women, seniors, and pregnant women. It is good to know that there are trusted websites where people could buy medicines. Not only it is very convenient because you can access it anywhere, but it is also very affordable compared to other stores and pharmacies. I like shopping online because I can see and compare different products to buy without needing to go outside. Ay, this is nice! I’ll check it out the nice time we make vitamin purchase. Sayang ngayon ko lang nabasa to, nakabili na kami new Ceelin for Nate. If this one’s a lot cheaper, I will certainly do my medicine orders here. Such a touching story. Love reading narratives of that kind. Makes me cry. Well, I enjoy crying nowadays. Seems silly yet try. Anyway, I like this online shop. Really makes life a lot easier for moms like me and the one you’ve mentioned in your intro. Will be checking this out. Thanks for the share. This is perfect! I just tried online grocery shopping yesterday and it was hassle-free. Sometimes I hate going to drugstores because more often than not, wala yung gamot na bibilhin ko. My kids meds are really hard to find anywhere. I’ll try their service one of these days. Dilemma ko rin kung sinong bibili sa labas ’cause I have no yaya. 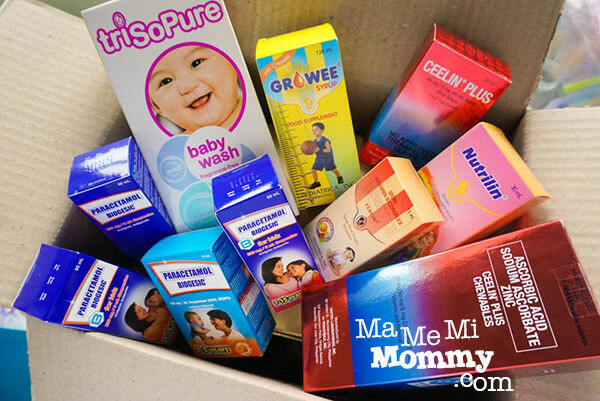 Now this will be a great help to moms like us who don’t have helpers and going out to buy something is a hassle. I always see Hey Mom but I don’t click it. So this is what it’s about. Thanks for sharing! Uy this is great, because moms are often alone with their babies. I also think it’s high time medicines get delivered, because they’re usually necessary! Sometimes, they’re even more important than food as they cn spell the difference between life and death, or comfort and unbearable pain.